The Article: Student Debt and the Crushing of the American Dream by Joseph Stiglitz in The New York Times. The Text: A CERTAIN drama has become familiar in the United States (and some other advanced industrialized countries): Bankers encourage people to borrow beyond their means, preying especially on those who are financially unsophisticated. They use their political influence to get favorable treatment of one form or another. Debts mount. Journalists record the human toll. Then comes bewilderment: How could we let this happen again? Officials promise to fix things. Something is done about the most egregious abuses. People move on, reassured that the crisis has abated, but suspecting that it will recur soon. The crisis that is about to break out involves student debt and how we finance higher education. Like the housing crisis that preceded it, this crisis is intimately connected to America’s soaring inequality, and how, as Americans on the bottom rungs of the ladder strive to climb up, they are inevitably pulled down — some to a point even lower than where they began. This new crisis is emerging even before the last one has been resolved, and the two are becoming intertwined. In the decades after World War II, homeownership and higher education became signs of success in America. Before the housing bubble burst in 2007, banks persuaded low- and moderate-income homeowners that they could turn their houses and apartments into piggy banks. They seduced them into taking out home-equity loans — and in the end, millions lost their homes. In other cases, the banks, mortgage brokers and real-estate agents pushed aspiring homeowners to borrow beyond their means. The wizards of finance, who prided themselves on risk management, sold toxic mortgages that were designed to explode. They bundled the dubious loans into complex financial instruments and sold them to unsuspecting investors. Everyone recognizes that education is the only way up, but as a college degree becomes increasingly essential to making one’s way in a 21st-century economy, education for those not to the manner born is increasingly unaffordable. Student debt for seniors graduating with loans now exceeds $26,000, about a 40 percent increase (not adjusted for inflation) in just seven years. But an “average” like this masks huge variations. According to the Federal Reserve Bank of New York, almost 13 percent of student-loan borrowers of all ages owe more than $50,000, and nearly 4 percent owe more than $100,000. These debts are beyond students’ ability to repay, (especially in our nearly jobless recovery); this is demonstrated by the fact that delinquency and default rates are soaring. Some 17 percent of student-loan borrowers were 90 days or more behind in payments at the end of 2012. When only those in repayment were counted — in other words, not including borrowers who were in loan deferment or forbearance — more than 30 percent were 90 days or more behind. For federal loans taken out in the 2009 fiscal year, three-year default rates exceeded 13 percent. America is distinctive among advanced industrialized countries in the burden it places on students and their parents for financing higher education. America is also exceptional among comparable countries for the high cost of a college degree, including at public universities. Average tuition, and room and board, at four-year colleges is just short of $22,000 a year, up from under $9,000 (adjusted for inflation) in 1980-81. Compare this more-than-doubling in tuition with the stagnation in median family income, which is now about $50,000, compared to $46,000 in 1980 (adjusted for inflation). Like much else, the problem of student debt worsened during the Great Recession: tuition costs at public universities increased by 27 percent in the past five years — partly because of cutbacks — while median income shrank. In California, inflation-adjusted tuition more than doubled in public two-year community colleges (which for poorer Americans are often the key to upward mobility), and by more than 70 percent in four-year public schools, from 2007-8 to 2012-13. With costs soaring, incomes stagnating and little help from government, it was not surprising that total student debt, around $1 trillion, surpassed total credit-card debt last year. Responsible Americans have learned how to curb their credit-card debt — many have forsaken them for debit cards, or educated themselves about usurious interest rates, fees and penalties charged by card issuers — but the challenge of controlling student debt is even more unsettling. 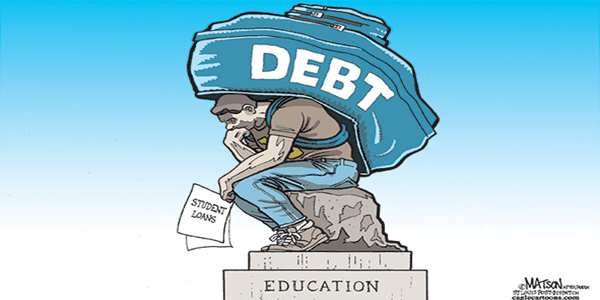 Curbing student debt is tantamount to curbing social and economic opportunity. College graduates earn $12,000 more per year than those without college degrees; the gap has almost tripled just since 1980. Our economy is increasingly reliant on knowledge-related industries. No matter what happens with currency wars and trade balances, the United States is not going to return to making textiles. Unemployment rates among college graduates are much lower than among those with only a high school diploma. America — home of the land-grant university, the G.I. Bill and world-class public universities from California to Michigan to Texas — has fallen from the top in terms of university education. With strangling student debt, we are likely to fall further. What economists call “human capital” — investing in people — is a key to long-term growth. To be competitive in the 21st century is to have a highly educated labor force, one with college and advanced degrees. Instead, we are foreclosing on our future as a nation. Student debt also is a drag on the slow recovery that began in 2009. By dampening consumption, it hinders economic growth. It is also holding back recovery in real estate, the sector where the Great Recession started. It’s true that housing prices seem to be on the upswing, but home construction is far from the levels reached in the years before the bubble burst of 2007. It’s a vicious cycle: lack of demand for housing contributes to a lack of jobs, which contributes to weak household formation, which contributes to a lack of demand for housing. As bad as things are, they may get worse. With budgetary pressures mounting — along with demands for cutbacks in “discretionary domestic programs” (read: K-12 education subsidies, Pell Grants for poor kids to attend college, research money) — students and families are left to fend for themselves. College costs will continue to rise far faster than incomes. As has been repeatedly observed, all of the economic gains since the Great Recession have gone to the top 1 percent. Consider another dubious distinction: student debt is almost impossible to discharge in bankruptcy proceedings. We’re a long way from the debtors’ prisons Dickens described. We don’t send debtors to penal colonies or put them in bonded labor. Although personal bankruptcy laws have been tightened, the principle that bankrupt individuals should be allowed a fresh start, and a chance to discharge excessive debt, is an established principle. This helps debt markets work better, and also provides incentives for creditors to assess the creditworthiness of borrowers. Yet education loans are almost impossible to write off in bankruptcy court — even when for-profit schools didn’t deliver what they promised and didn’t provide an education that would let the borrower get a job that paid enough to pay back the loan. We should cut off federal support for these for-profit schools when they fail to graduate students, who don’t get jobs and then default on their loans. To its credit, the Obama administration tried to make it tougher for these predatory schools to lure students with false promises. Under the new rules, schools had to meet one of three tests, or lose their eligibility for federal student aid: at least 35 percent of graduates had to be repaying their loans; the typical graduate’s estimated annual loan payments could not exceed 12 percent of earnings; or the payments could not exceed 30 percent of discretionary income. But in 2012, a federal judge struck down the rules as arbitrary; the rules remain in legal limbo. The combination of predatory for-profit schools and predatory lenders is a leech on America’s poor. These schools have even gone after young veterans who served in Iraq and Afghanistan. There are heart-rending stories of parents who co-signed student loans — only to see their child killed in an accident or die of cancer or another disease — and, like students, can’t easily discharge these debts. Interest rates on federal Stafford loans were set to double in July, to 6.8 percent. Good news came on Friday: it appears that there is a temporary reprieve, as Republicans have come around. But the stay would be temporary and would not address a more fundamental issue: if the Federal Reserve is willing to lend to the banks that caused the crisis at just 0.75 percent, shouldn’t it be willing to lend to students, who will be crucial to our long-term recovery, at an appropriately low rate? The government shouldn’t be profiting from our poorest while subsidizing our richest. A proposal by Senator Elizabeth Warren, Democrat of Massachusetts, for lower student-loan interest rates is a step in the right direction. Along with tougher regulation of for-profit schools and the banks they connive with, and more humane bankruptcy laws, we must give more support to middle-class families struggling to send their children to college, to ensure that they have a standard of living at least equal to that of their parents. But a real long-term solution requires rethinking how we finance higher education. Australia has designed a system of publicly provided income-contingent loans that all students must take out. Repayments vary according to individual income after graduation. This aligns the incentives of the providers of education and the receivers. Both have an incentive to see that students do well. It means that if an unfortunate event happens, like an illness or an accident, the loan obligation is automatically reduced. It means that the burden of the debt is always commensurate with an individual’s ability to repay. The repayments are collected through the tax system, minimizing the administrative costs. Some wonder how the American ideal of equality of opportunity has eroded so much. The way we finance higher education provides part of the answer. Student debt has become an integral part of the story of American inequality. Robust higher education, with healthy public support, was once the linchpin in a system that promised opportunity for dedicated students of any means. We now have a pay-to-play, winner-take-all game where the wealthiest are assured a spot, and the rest are compelled to take a gamble on huge debts, with no guarantee of a payoff. Even if compassion isn’t a factor — even if we focus just on recovery now and growth and innovation tomorrow — we must do something about student debt. Those concerned about the damage America’s growing divide is doing to our ideals and our moral character should put student debt at the top of any reform agenda.